We’re happy to deal with small and large scale pigeons problems. We use a range of methods for pigeon control and pigeon proofing, as well as doing pigeon mess clearance. We’ve specialist skills and qualifications in bird control, as well as years of experience of bird behaviour. We can provide you with professional and effective bird control, bird proofing, bird removal and waste clearance solutions, no matter what the situation. We deal with pest pigeons in many places, including: houses, industrial units, workshops, courtyards, solar panels, balconies, roofs, eaves, shop signage, historic monuments, institutions, health centres and derelict buildings. Wildlife Legislation protects all birds but pigeons are classed as ‘pest birds’, which allows some things to be done about them. Animal Welfare laws apply to pigeons too. Working with birds and clearing their waste can be very hazardous to human health as well. You can trust us to do pigeon control legally, humanely and safely. Don’t let a bird problem or pigeon problem get out of hand because it could harm your health, property or business. If in doubt, ring or email us for professional pest control advice on how to control pigeons and birds and get rid of pigeons and birds. 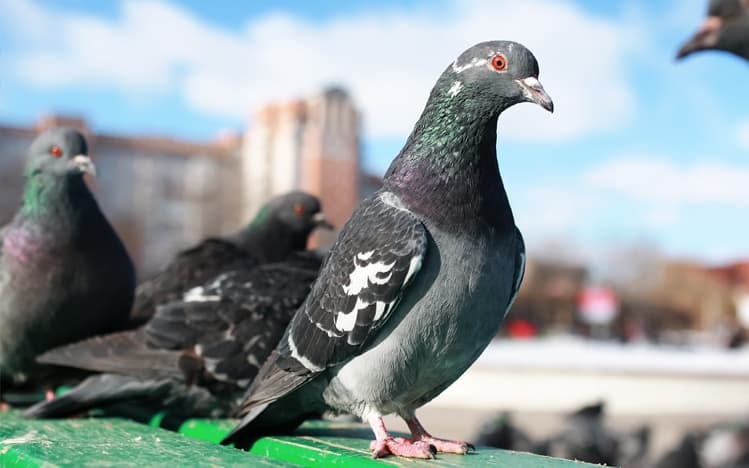 We’ve 35 years’ experience in pest control and provide free surveys for pigeon control, pigeon proofing, pigeon removal and pigeon waste clearance. And we’re available 7 days a week for advice. We really do know what we’re doing; you can trust us to get it right. There’s more information below as well about our pigeon and bird control, pigeon and bird proofing, pigeon and bird removal and pigeon and bird waste clearance. All birds and their nests, eggs and young are protected by The Wildlife and Countryside Act 1981. However, pigeons are classed legally as Pest Birds because they are a risk to public health and safety so it is legal to carry out pest bird and pigeon control in Scotland. The law is very specific though on when and how pest birds like pigeons can be controlled. The law changes yearly so what was legal one year could be illegal the next and the laws vary across the UK too. Animal Welfare laws apply to pigeons as well. Always get professional pest control advice when it comes to bird control and pigeon control, otherwise you could end up in court for committing Wildlife Crime. Diseases that cause illness and death in man are carried by pest pigeons especially. Recently there were sad deaths of two patients at an Edinburgh hospital due to a disease that they caught from pigeons at the hospital. And this isn’t the first time such deaths have been reported, such as this case. Pigeons are ridden with diseases that affect the gut and lungs and are harmful or fatal to humans: common ones are respiratory diseases like Psittacosis and Avian ‘flu, and severe food poisoning and body infections from Salmonella and E. coli. You don’t need to actually touch a pigeon to catch the diseases, just touch things they’ve contaminated or breathe in air that’s been around them. And it isn’t just nasty gut and lung diseases that pigeons can pass on to us. The birds have a lot of insects living on them and in their mess. Pigeons in the attic can infest a house with bird fleas and bird mites that will bite you to feed on your blood. Beetles, Flies and Moths breed in pigeon mess and nests and then infest buildings. Blowflies breed in dead pigeons and infest buildings. Pigeons produce a lot of vile, slippery droppings as well – not what you want on the ground and underfoot. Pigeons sitting on shop signs, pigeons on a fire escape, pigeons on gutters and pigeons on pipes on a wall are common causes of this slip hazard. Pigeons live in and on roofs, in chimneys and under solar panels too. Their mess weakens roofs, blocks gutters and downpipes, can cause structural damage, damage solar panels and produce fly and insect infestations in chimneys..
Pest pigeons on balconies needed bird proofing for bird control of a pigeon problem in Dundee. We got rid of pest pigeons in Glenrothes from inside a semi-derelict building using bird control. A historic monument needed bird control in Forfar to get rid of pigeons too, followed by clearance of pigeon waste that was knee deep. Pest pigeons are a nuisance for shops as well; we’ve used bird control and bird proofing in Dunfermline for pigeon control on shop signs and frontages. Fire escapes are a favourite place for pigeons to sit and we’ve got rid of pigeons in Perth many times because of this. We’ve pigeon proofed courtyards infested with pigeons for pigeon bird control in Stirling and whole alleyways for pigeon bird control in Perth. We used bird proofing in St Andrews for pigeon bird control at an industrial unit that had their security alarms set off all the time by pigeons at night. And we’ve been called out to catch pigeons stuck in buildings so they don’t cause a mess and set off the alarms. We used this bird control to get rid of pigeons in Edinburgh in a shop at 10pm one evening; the staff were as glad to be out of the shop as the pigeons were. We use a wide range of bird control methods for pigeon control, very often using several together. Bird netting: we use well-made pigeon netting net that lasts for years. We can fit entry points in it for access for maintenance behind it - we have even fitted whole gates for machinery access to a pigeon-netted works area. Bird spiking: our pigeon-spiking is proven to last and be truly effective - we do not want to go to the trouble of installing it only for it to be useless. There are many makes of bird-spikes available but many are poorly made; for example, the spikes are not long enough to keep the birds away, not dense or strong enough to stop the birds pushing past them, not fixed well to the base and fall off, the base is too weak and cracks open and so on. Bird wire and mesh: useful to get rid of some pigeon problems. Bird Gel, which is expensive but works wonders in particular problem spots to get rid of pigeons and for bird control. Avishock electrical deterrent system for bird control: a specialist product for specific situations. Daddy Long Legs and prickler strips for bird control: to stop them sitting but not effective against pigeons nesting or roosting. Nest, eggs and chick removal for bird control: as part of pigeon clearance and pigeon proofing. Cage-trapping, landing nets and shooting for bird control: to get rid of pigeons where they are causing a temporary nuisance or where bird proofing is not wanted. Laser deterrence for bird control: we have had training in the safe use of lasers for pigeon control. Solar panel bird-proofing: a permanent solution to stop pigeons nesting at solar panels. Bird clearance: pigeon clearance and pigeon waste removal from gutters, roofs, whole buildings, fire escapes – wherever needed! Chimney guards: for control of pigeons nesting in chimneys. We remove dead birds from chimneys and treat fly infestations from them too. Free surveys with written, no obligation quotations. Powered Access Licence holder, types 3a & b; ticketed to operate access equipment for at-height works. Expert knowledge of pigeon problems and solutions from our specialist pest control qualifications. Domestic, Food Business, Commercial, Agricultural, Amenity. We’ve the knowledge and skills to provide professional bird control, pigeon control and bird and pigeon clearance for a wide range of customers. Nationally accredited: member of the British Pest Control Association (BPCA). Safe, Humane and Legal Pest Control. I agree to Andy Law Pest Control collecting & storing information to process my enquiry. Andy Law Pest Control has been a complete pleasure to work with. I had a pretty major pigeon infestation in my apartment balcony, and the pigeons made a horrible mess. Andy came over for a free inspection, and emailed me a very clear and comprehensive breakdown of my options and their pros and cons. After agreeing to the job, they (very thoroughly!) cleaned and disinfected the balcony, and then did a brilliant bird-proofing installation. It's been completely effective, and I can't recommend them highly enough. Thank you! NEED EXPERT ADVICE AND PROFESSIONAL PEST CONTROL? Call us on 01738 813751 or email us with the details for expert pest control advice. You can also phone or text our emergency number 07767353535. We’re available 7 days a week. Have You Spotted Any Crawling Ants Yet? How Much Damage Can Rabbits Cause?